123:0.3 Throughout the two years of their sojourn at Alexandria, Jesus enjoyed good health and continued to grow normally. Aside from a few friends and relatives no one was told about Jesus' being a "child of promise." 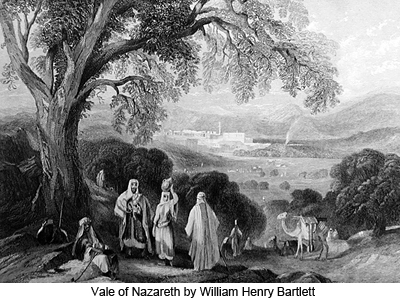 One of Joseph's relatives revealed this to a few friends in Memphis, descendants of the distant Ikhnaton, and they, with a small group of Alexandrian believers, assembled at the palatial home of Joseph's relative-benefactor a short time before the return to Palestine to wish the Nazareth family well and to pay their respects to the child. On this occasion the assembled friends presented Jesus with a complete copy of the Greek translation of the Hebrew scriptures. But this copy of the Jewish sacred writings was not placed in Joseph's hands until both he and Mary had finally declined the invitation of their Memphis and Alexandrian friends to remain in Egypt. 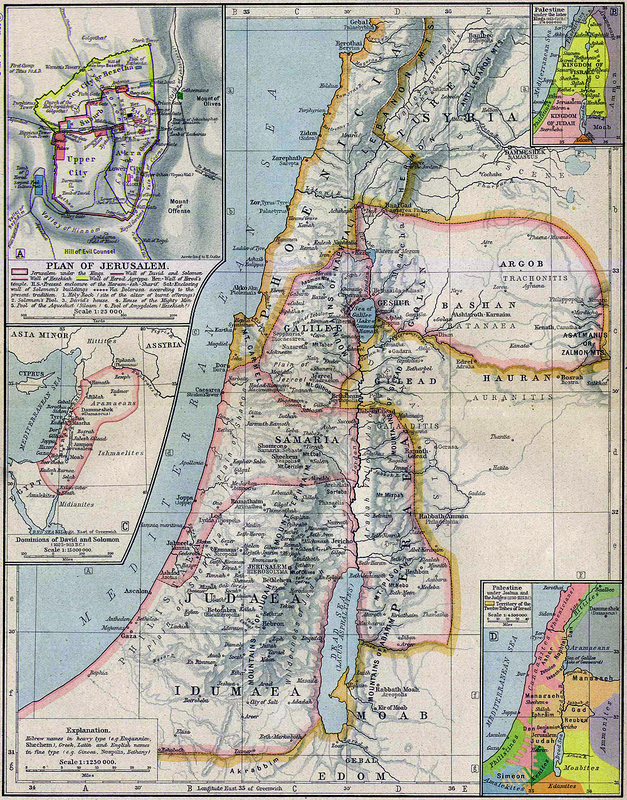 These believers insisted that the child of destiny would be able to exert a far greater world influence as a resident of Alexandria than of any designated place in Palestine. These persuasions delayed their departure for Palestine for some time after they received the news of Herod's death. 123:0.4 Joseph and Mary finally took leave of Alexandria on a boat belonging to their friend Ezraeon, bound for Joppa, arriving at that port late in August of the year 4 B.C. They went directly to Bethlehem, where they spent the entire month of September in counsel with their friends and relatives concerning whether they should remain there or return to Nazareth. 123:0.5 Mary had never fully given up the idea that Jesus ought to grow up in Bethlehem, the City of David. 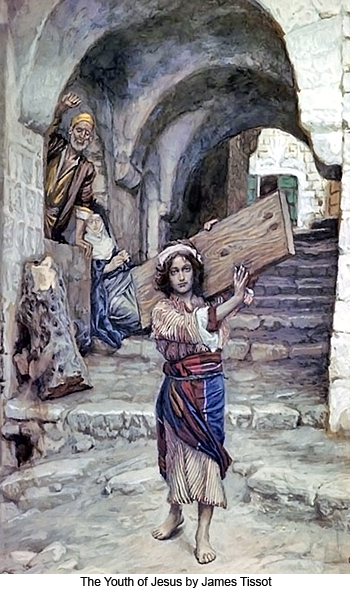 Joseph did not really believe that their son was to become a kingly deliverer of Israel. Besides, he knew that he himself was not really a descendant of David; that his being reckoned among the offspring of David was due to the adoption of one of his ancestors into the Davidic line of descent. Mary, of course, thought the City of David the most appropriate place in which the new candidate for David's throne could be reared, but Joseph preferred to take chances with Herod Antipas rather than with his brother Archelaus. 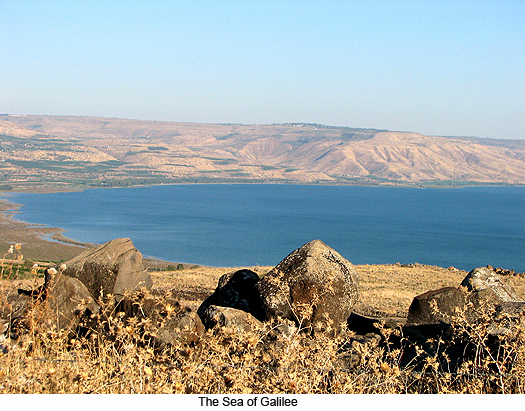 He entertained great fears for the child's safety in Bethlehem or in any other city in Judea, and surmised that Archelaus would be more likely to pursue the menacing policies of his father, Herod, than would Antipas in Galilee/ And besides all these reasons, Joseph was outspoken in his preference for Galilee as a better place in which to rear and educate the child, but it required three weeks to overcome Mary's objections. 123:2.1 In something more than a year after the return to Nazareth the boy Jesus arrived at the age of his first personal and wholehearted moral decision; and there came to abide with him a Thought Adjuster, a divine gift of the Paradise Father, which had aforetime served with Machiventa Melchizedek, thus gaining the experience of functioning in connection with the incarnation of a supermortal being living in the likeness of mortal flesh. 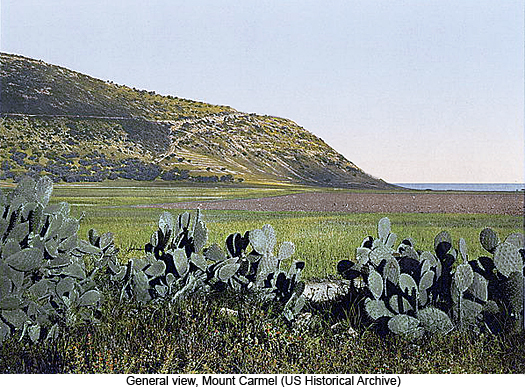 This event occurred on February 11, 2 B.C. 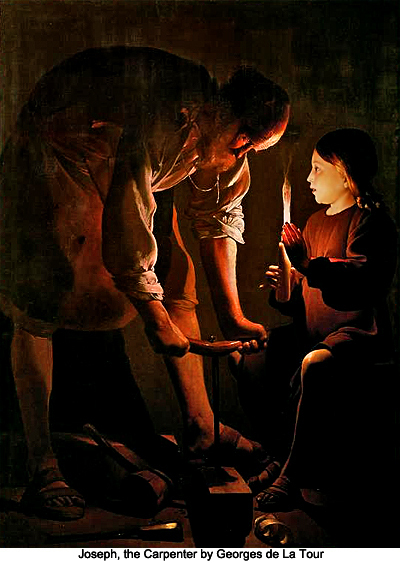 Jesus was no more aware of the coming of the divine Monitor than are the millions upon millions of other children who, before and since that day, have likewise received these Thought Adjusters to indwell their minds and work for the ultimate spiritualization of these minds and the eternal survival of their evolving immortal soul. 1. The newborn child, the first to the eighth day. 2. The suckling child. 3. The weaned child. 4. The period of dependence on the mother, lasting up to the end of the fifth year. 5. The beginning independence of the child and, with sons, the father assuming responsibility for their education. 6. The adolescent youths and maidens. 7. The young men and the young women. 123:2.13 It was the custom of the Galilean Jews for the mother to bear the responsibility for a child's training until the fifth birthday, and then, if the child were a boy, to hold the father responsible for the lad's education from that time on. 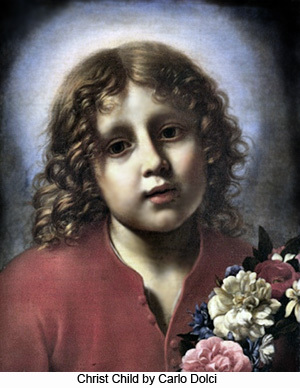 This year, therefore, Jesus entered upon the fifth stage of a Galilean Jewish child's career, and accordingly on August 21, 2 B.C., Mary formally turned him over to Joseph for further instruction. 123:2.14 Though Joseph was now assuming the direct responsibility for Jesus' intellectual and religious education, his mother still interested herself in his home training. She taught him to know and care for the vines and flowers growing about the garden walls which completely surrounded the home plot. 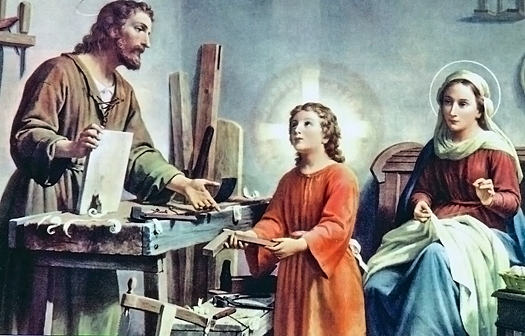 She also provided on the roof of the house (the summer bedroom) shallow boxes of sand in which Jesus worked out maps and did much of his early practice at writing Aramaic, Greek, and later on, Hebrew, for in time he learned to read, write, and speak, fluently, all three languages. 123:2.15 Jesus appeared to be a well-nigh perfect child physically and continued to make normal progress mentally and emotionally. He experienced a mild digestive upset, his first minor illness, in the latter part of this, his fifth (calendar) year. 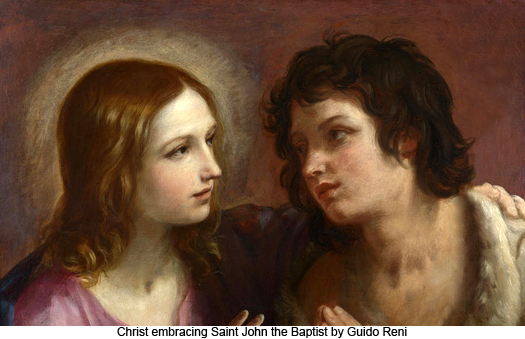 123:2.16 Though Joseph and Mary often talked about the future of their eldest child, had you been there, you would only have observed the growing up of a normal, healthy, carefree, but exceedingly inquisitive child of that time and place. 123:3.1 Already, with his mother's help, Jesus had mastered the Galilean dialect of the Aramaic tongue; and now his father began teaching him Greek. 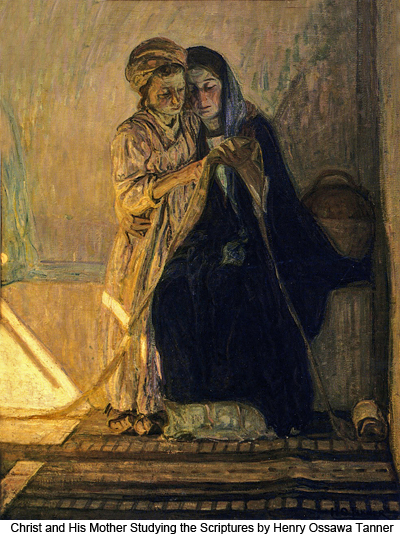 Mary spoke little Greek, but Joseph was a fluent speaker of both Aramaic and Greek. The textbook for the study of the Greek language was the copy of the Hebrew scriptures—a complete version of the law and the prophets, including the Psalms —which had been presented to them on leaving Egypt. 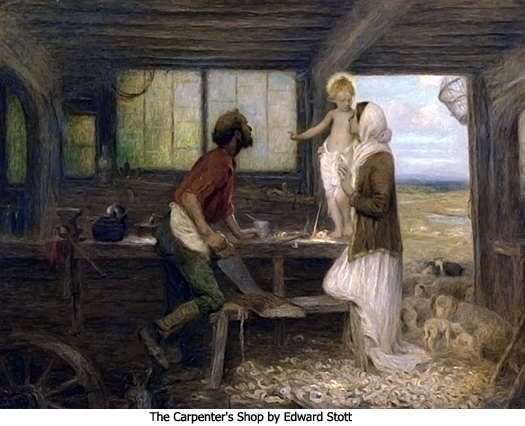 There were only two complete copies of the Scriptures in Greek in all Nazareth, and the possession of one of them by the carpenter's family made Joseph's home a much-sought place and enabled Jesus, as he grew up, to meet an almost endless procession of earnest students and sincere truth seekers. Before this year ended, Jesus had assumed custody of this priceless manuscript, having been told on his sixth birthday that the sacred book had been presented to him by Alexandrian friends and relatives. And in a very short time he could read it readily. 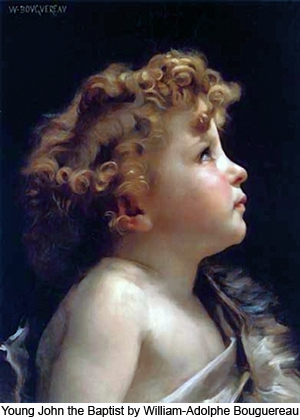 123:3.2 The first great shock of Jesus' young life occurred when he was not quite six years old. It had seemed to the lad that his father—at least his father and mother together—knew everything. 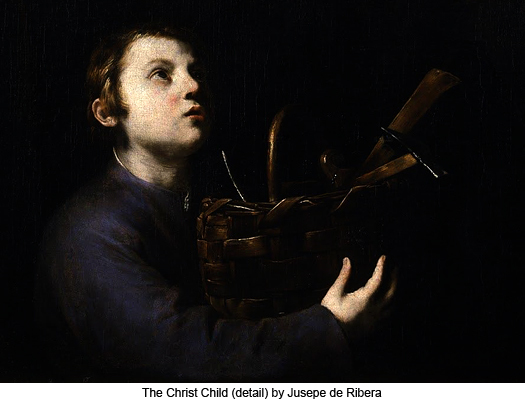 Imagine, therefore, the surprise of this inquiring child, when he asked his father the cause of a mild earthquake which had just occurred, to hear Joseph say, "My son, I really do not know." Thus began that long and disconcerting disillusionment in the course of which Jesus found out that his earthly parents were not all-wise and all-knowing. 123:3.8 The next few years Joseph did considerable work at Cana, Bethlehem (of Galilee), Magdala, Nain, Sepphoris, Capernaum and Endor, as well as much building in and near Nazareth. As James grew up to be old enough to help his mother with the housework and care of the younger children, Jesus made frequent trips away from home with his father to these surrounding towns and villages. Jesus was a keen observer and gained much practical knowledge from these trips away from home; he was assiduously storing up knowledge regarding man and the way he lived on earth. 123:3.10 Much of his spare time—when his mother did not require his help about the house—was spent studying the flowers and plants by day and the stars by night. He evinced a troublesome penchant for lying on his back and gazing wonderingly up into the starry heavens long after his usual bedtime in this well-ordered Nazareth household. 123:5.2 For three years—until he was ten—he attended the elementary school of the Nazareth synagogue. For these three years he studied the rudiments of the Book of the Law as it was recorded in the Hebrew tongue. For the following three years he studied in the advanced school and committed to memory, by the method of repeating aloud, the deeper teachings of the sacred law. 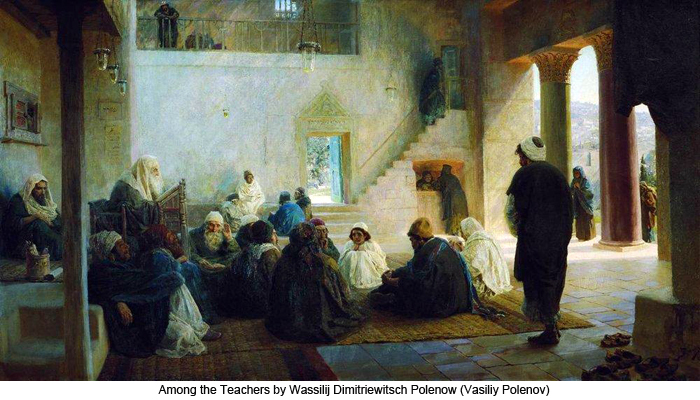 He graduated from this school of the synagogue during his thirteenth year and was turned over to his parents by the synagogue rulers as an educated "son of the commandment"—henceforth a responsible citizen of the commonwealth of Israel, all of which entailed his attendance at the Passovers in Jerusalem; accordingly, he attended his first Passover that year in company with his father and mother. 123:5.8 Jesus received his moral training and spiritual culture chiefly in his own home. He secured much of his intellectual and theological education from the chazan. But his real education—that equipment of mind and heart for the actual test of grappling with the difficult problems of life—he obtained by mingling with his fellow men. It was this close association with his fellow men, young and old, Jew and gentile, that afforded him the opportunity to know the human race. 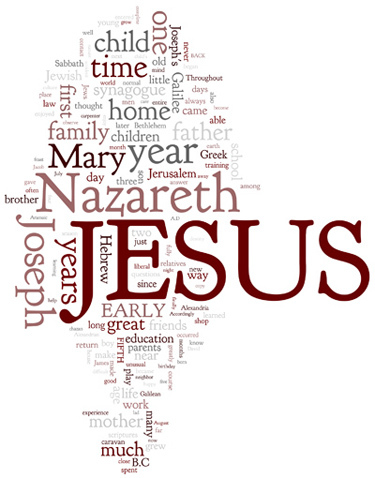 Jesus was highly educated in that he thoroughly understood men and devotedly loved them.